I think the best part of a restaurant salad are those cool sweetened pecans they top it with (although, the crumbled goat cheese is good too). The only problem with these is they're often a bit too sweet, candied. So, I made my own. The other night, we were still detoxing from too many burgers eaten at a cookout. We had salads with some lentils on the side. Very satisfying. 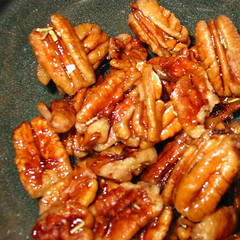 But, at the last minute, I had the urge for some slightly sweetened roasted pecans on the salad. This is how I made mine. Took about 5 minutes on the stovetop with a non stick pan. They were wonderful. Frankie loved them too. A handful of pecans (ca. 1/2 cup) were tossed into a non-stick fry pan on medium high heat with about a tablespoon of olive oil and a teaspoon of rosemary sprinkled over it all. Then, I sprinkled about a tablespoon of sugar over the mixture, continued heating and then poured about 3 tablespoons of water over the whole hot mixture. The water dissolved the sugar and suspended the rosemary. For the next few minutes I swirled the nuts in the hot solution letting the water evaporate. After the water was gone, I continued to heat the nuts for about 2-3 minutes and finally dumped them from the pan onto a wooden cutting board. When the sticky hot nuts cooled they were mildly candied and crisp. The rosemary was a fabulous touch. A friend of ours makes something similar but I forget her process. Thanks for the inspiration Amy! With the kid, you can never have enouh nuts around. Hope you enjoy them. Uh, what about meat? I visited Big Nates (Nate Thurmand) BBQ in SF last night. I had pork ribs. That's meat. Didn't have room for the pecan pie, cause I had meat. I know pecans are good, but did you have meat? ? Yeah, the day before I had so much meat, I almost went into a coma, a meat coma. Needed a rest. Oh, Meat Coma. Yeah, that's not good. I'll usually start the day with some cereal that makes you poop. It helps.